This tour is an example of our self drive tours, where we supply a road book with detailed information per day about routing, activities and interesting places. Arrival in Cape Town where you will be met by us and transferred to your hotel near the V&A Waterfront Welcome Dinner and Tour briefing. 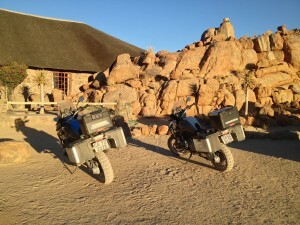 Day 2 – Pick-up Bikes – Cape Town. Transfer to collect the rental motorcycles in the morning. Day to ride around the Peninsula and enjoy the coastal roads. We suggest you take the R27 traversing a region known as the Cape West Coast. You will join the N1 highway out of town and soon after take the Paarden Island turn-off as soon as you leave the city. You will be riding away from Table Mountain, thus in a northerly direction. It is a picture perfect introduction to what awaits you on your Namibian Adventure. It is a region of contrasting landscapes and untamed ruggedness. In spring nature colours this arid landscape with a dense carpet of brightly coloured flowers and this wonder of nature attracts visitors from afar. You will eventually join the N7 which is the main artery linking Namibia with the Cape. You will stay on the N7 and eventually reach Springbok which is the last big town before you reach the Namibian border at Noordoewer. Dinner can be enjoyed at the lodge on your own account. You head back to the N7 to continue your journey north towards the Namibian border. The terrain is becoming noticeably more and more arid. Some would even say hostile given the miles of uninhabited land you ride past. Your next stop will be the border post where you will also cross one of the major rivers in SA, the Orange, also known as the Gariep River. The mighty Orange River forms a natural border between SA and Namibia and has its origins in the Drakensberg Mountains. After you have finished the formalities at customs, continue along the B1 and turn off onto the D316, your first taste of gravel. Continue along the D316 and then join the C37 which will take you to the lodge and past the lodge if you first choose to visit the Fish River Canyon. This will be up to you, depending how you are doing for time, but given that tomorrow is a long day, we suggest you plan your day so that you allow time to visit the canyon today. There is an entrance fee payable at the gate to the Fish River Canyon as well as a small road tax when entering into Namibia. 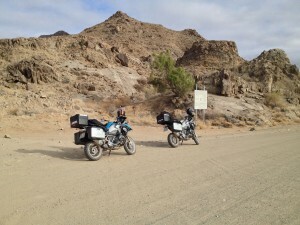 After an early breakfast you head out towards Keetmanshoop and then Stampriet. You can make your way back to the B1 main road which is an asphalt road, or you can continue to explore the gravel roads of Southern Namibia. 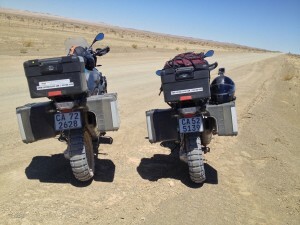 If you choose gravel then you will ride along the C37 and join the C12 to Seeheim where after you enjoy a short stretch of asphalt till you reach Keetmanshoop. If you opt for the faster B1, consult your map to find the best and shortest route to the B1, in our opinion it will be the C37/C12 to Grűnau where you join the B1. From Keetmanshoop we recommend the M29 gravel road – you are now entering the western stretches of the Kalahari Desert. First you take the C17 outside of town and then the M29 forks off the C17. Follow the M29 until you reach the C18 turn off to Gochas and at Gochas take the C15 to Stampriet. Once again you can opt for the faster, more boring asphalt option and continue along the B1 to Marienthal and shortly after turn right to Stampriet. Outside of Keetmanshoop are some attractions to be viewed – The quiver tree forest, the Giants Playground and a Mesosaurus Fossil Park. Your next destination is the capital city of Windhoek. The city is centrally located in Namibia at an elevation of 1700m above sea level. Our ride there can be considered a relaxing ride with again the dull and flat B1 as the faster asphalt option, or the more interesting gravel options. From Stampriet you continue to ride the Kalahari Desert plains if you follow the C15 all the way via Ulenhorst until you reach Dordabis where you join the asphalt road again – this will be the C23. Stay on the C23 until you reach the B6 coming in from Gobabis. Turn left and head towards Windhoek. We suggest you ask the lodge manager to arrange for a taxi and go to Joe’s Beerhouse for dinner (you can also walk the approximately 1.2KM if you prefer). This local eatery in Windhoek is a must-do for all visitors to the city. Windhoek is also a good spot to get money or do any shopping if you need anything. After enjoying your breakfast in the relaxing surroundings of the guest house, it is time to get going direction Etosha National Park. Today it is asphalt all the way. From the guest house you need to ride to the B1 main road and head north. Once you are out of the city surrounds you stay on the B1 main road towards Okahandja. You continue on the B1 and your next destination is Otjiwarongo. In Otjiwarongo you need to be on the lookout for the road signs showing C38. Your first destination on the C38 will be Outjo and then either Okaukuejo or Andersons Gate. Both the last two names mentioned are inside the Etosha Park. The first is the rest camp and the latter the entrance gate to the park. Etosha Safari Camp is situated approximately 10km south of Andersons Gate along the C38. **One full day safari to Etosha National Park will be arranged for day 8. 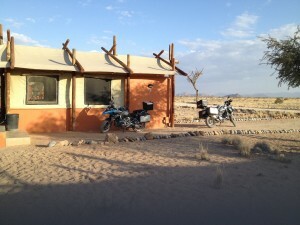 After relaxing in and near Etosha, it is time to ride again. We back track our previous route to Outjo along the C38. From Outjo we recommend you take a scenic short cut along the M63 which is a gravel road. NB – Please be mindful that you might encounter Kudu, Oryx or Warthog in these remote parts of Namibia – be careful and on the lookout for any kind of animals crossing the roads. They have right of way. The turn off is just outside of Outjo and it shows a road sign indicating “Kalkfeld”. Then we join the C33 where we turn right to the town of Omaruru. You still continue out of Omaruru town in a southerly direction staying on the C33. Note that there is a sharp turn to the left as you leave town. Shortly after this sharp turn will you see the turn off onto the D2315. We suggest you take it easy along this road as there is an entrance gate you need to pass through. Your purpose of the visit is your stay ay Ai-Aiba…if they ask. There might be some river crossings along this road, but it depends on the rainfall further up north – be warned. Enquire at the lodge about the Bushman Living Museum tours which is located on the neighboring property. Another exiting day awaits you with some spectacular roads and scenery to be enjoyed. You will ride along the D2315 towards the Atlantic Coast. The road will be winding through the impressive Erongo Mountains as you make your way out of the conservancy. You will reach a t-junction along the D2306, turn left and continue until the road forks and take the D1927 to the right. Continue along the D1927 until you get to the D1930, turn left again and fairly soon you will reach the B2 main road/D1918 intersection. Take some time and ride to Grosse Spitzkuppe Nature Reserve along the D1918 and D3716. This group of bald granite peaks or bornhardts is known as Spitzkuppe and it is considered Namibia’s own Matterhorn – a must see on any visitors bucket list. You should be able to see the spectacle from a distance. The rock arches and shapes makes for great photo opportunities. From here you need to ride back to the B2 main road along the D3716 and D1918. As you near the coast, the landscape changes as it become more barren as the cool coastal air sets in… this is normally a welcome relief. Continue to Swakopmund and take some time to wander around the town. Try Kucki’s Pub and Restaurant for dinner tonight, our all time favorite for Eisbein and Jagermeister. Alternatively if you decide you do not wish to ride on so much gravel today you can return to Omaruru and travel down the C33 to Karibib and join the B2 here. You can still do the above detour to the Spitzkuppe Nature Reserve as a round trip via the D1930/D3716 & D1918 if you choose to take this route. Today you depart for Sosussvle via the remote town or rather place of Solitaire You follow the B2 towards Walvis Bay until you get to the big circle, and then you head to Solitaire along the C14 – all the way! This route cuts through sections of the Namib Naukluft Park and you ride through the Kuiseb Canyon and Gaub Pass. Take note that also you cross the Tropic of Capricorn, a well-known landmark and milestone on any tour. It is well signposted and worth a photo stop. Take a few minutes and stop in Solitaire, you cannot miss it. The settlement’s best known resident passed away a few months ago. He was Moose Macgregor and he was famous for his great Apfelstrudel, sold at the little bakery next to the filling station…try it before you continue on the C19 to Sersriem and your accommodation for tonight. Your guest farm is located along the C14 outside of Solitaire. An early start from the Lodge to enter the Namib-Naukluft Park at sunrise, while the temperature is still mild and when the dune contrasts are at their best. You will travel in one of our all-terrain URI Gameviewer vehicles, custom-built in Namibia for the Lodge, with your own specially trained guide who will share all his knowledge of the area, animals, plant life and much more with you. Regular stops are made on the spectacular ±60 kilometre drive through the dune corridor down to the Vlei to gain information or take in the vistas. At Dune 45, we make a stop to view the world’s most photographed dune. Further along, a gradual 2,6 kilometer round-trip guided walk up to Dead Vlei is a must for the healthy visitors. The more energetic have the opportunity to climb to the upper ridge of Big Daddy Dune, one of the highest dunes in this area! We spend time exploring Sossusvlei before returning to the Lodge approximately 5½ hours later in time for lunch. Once you are finished you activities, you will check out and ride to Helmeringhausen today. From the lodge head back towards Sesriem and the ride along the C27 to a settlement called Betta, a one horse town proverbial speaking. From Betta, you have to stay on the C27 and continue to Helmeringhausen where you stay for the night. NB – Beware of other traffic on the road and of loose gravel between Sesriem and Helmeringhausen. From Helmeringhausen you ride the last of the next two day’s gravel. You back track yesterday’s route for a few kilometres and ride towards Aus along the C13. After approximately 105km you reach the B4 and turn right towards Lüderitz. Approximately 25km’s after turning right there is a view point to try and see Aus’s main attraction – that of the desert dwelling feral horses. Believed to have been left behind by the German Schutztruppe when they vacated Deutsch West Afrika, these animals have managed to survive for decades and have adapted in a way that few other domesticated animals could have. You might be lucky and see them right next to the road. The hide at the viewpoint is close to their main source of water and always a good place to stop and view them as well as soak up the tranquillity of the surroundings. From here you continue to Lüderitz along the B4. On the way into town as you make your way through the sand dunes trying to take over the road, look out for Kolmanskop Mining Town. This ghost mining town conducts tours in the morning and it is worth a visit. Try to make the 09h30 tour tomorrow. You can buy tickets at the gate. After enjoying a good night’s rest and a morning visit to the ghost mining town of Kolmanskop, you ride back to Aus along the B4 main road. Outside of Aus you need to turn right and head south towards Rosh Pinah. This small mining town close to the South African border is one of the largest zinc and lead mines in Namibia. Today it’s asphalt all the way and Aus will be a good lunch stop, try the Bahnhof Hotel. Then it is one long straight road to Rosh Pinah. From the mines to the vineyards today it will be! This morning you enjoy your last gravel section as you follow the windy course of the mighty Orange River along route C13. The Orange flows all the way from the Lesotho Highlands to the cold Atlantic where she dumps her precious diamonds. There will be no time for diamond hunting, but the scenery is for free. The age old canyons and river views along the C13 are spectacular all the way to Aussenkehr where you join the asphalt roads again. Next on the agenda is Noordoewer, the border crossing and then back in South Africa. From Noordoewer you stay on the N7 all the way to Vredendal. You will pass Springbok again and numerous other settlements you passed through on the way to Namibia. Your destination is Vredendal. The GPS should take you all the way to Van Rhyns Dorp next to the N7 where you will turn off to Vredendal. Soon after will you see stretched out vineyards and cross the Oliphants River as you enter the town. After breakfast you can ride all the way to Cape Town along the N7, or you can enjoy a detour taking you to some favourite holiday destinations on the Cape West Coast. Perhaps stop in Langebaan and visit the West Coast National Park. Here you need to pay a small entrance fee and the road will take you to the R27. Once on the R27, you will ride past the turn off to Yzerfontein and then you should be able to see Table Mountain in the distance on a clear day. Please give Thomas a quick call after checking in so we can meet you at the rental depo and transfer you back to the hotel after you have dropped off your bikes. Please be mindful of road conditions all over Namibia. The gravel can sometimes be better than the paved roads we are so used to riding on. The C routes are normally well maintained whereas the D route does not get the same attention as the busier C routes. Always take care and rather approach these with caution. Heavy traffic and rain during the early summer season can also change road conditions overnight. Beware of Super-Links – these are 26 wheeler trucks that are 22 metres long and can way up to 56 tons. Although they are legally not permitted to travel faster than 80KM/H, they do not always adhere to this and can be found travelling at speeds over 120KM/H on the open road. Total distance 4760km approximately with a daily average of 363km approximately – updated distances. Approximately 60% of the route as suggested is asphalt or sealed roads and the other 40% gravel which varies from very nice compact surfaces to limited areas where we might encounter some loose sand and gravel. Please keep in mind that on most days during the return leg, you will have alternative routes to follow which will be paved surfaces. Experience have proven that riders do get tired and wish to have alternative options available to do more paved routes when returning to Cape Town. All distances are approximate distances and will depend on whether you follow the route as it has been planned or follow your own alternative route. We recommend you make space for some drinking water and stock up each morning before leaving your accommodation.